Mr. Angel Gurría, Secretary-General of the OECD, hosted H.E. Michelle Bachelet, President of the Republic of Chile, during her visit to the OECD on Tuesday 9 June 2015, coinciding with the 5th anniversary of Chile’s accession to the Organisation. The Secretary-General and the President met bilaterally. Mrs. Bachelet also delivered a keynote speech in the context of the OECD Leaders’ Programme. 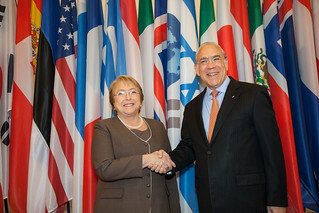 Presidenta Bachelet en la OCDE: “Lo que nos motiva es nuestro compromiso de dar más y mejores oportunidades para nuestra sociedad"
9 June 2015 - Michelle Bachelet, President of Chile with Angel Gurría, OECD Secretary-General at OECD Headquarters, Paris.